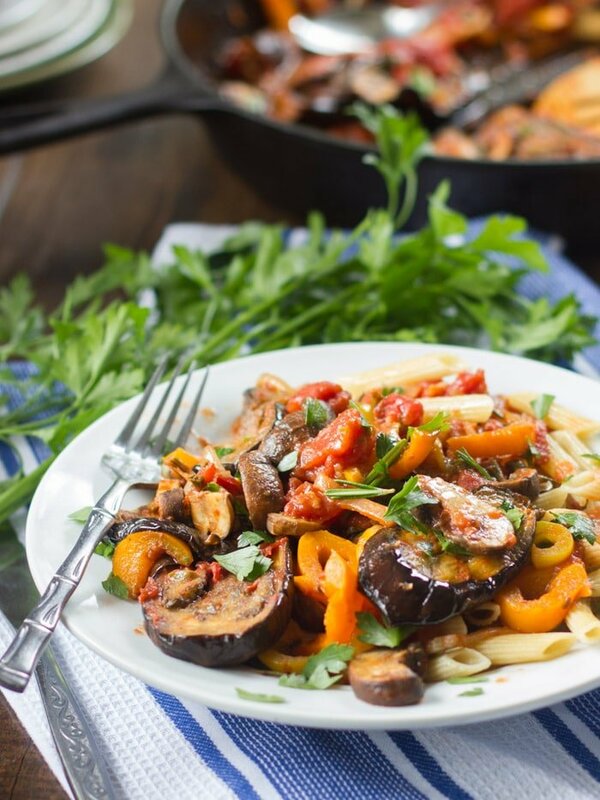 This vegan eggplant cacciatore is made with melt-in-your mouth slabs of roasted eggplant simmered in a light white wine tomato sauce with savory mushrooms, garlic and bell peppers. At some point when I was growing up my mom discovered chicken cacciatore and it quickly became on of her favorite dinners to make. Somehow, I don’t think I ever tried it though. I’m not sure if I’d already gone vegetarian at that point, or maybe was just close to making the switch and not terribly interested in chicken. I guess I was at an age when I wasn’t much interested in vegetables either. I’ve always been okay with veggies, but when I was thirteen I just didn’t get psyched up over eggplant and bell peppers like I do today. 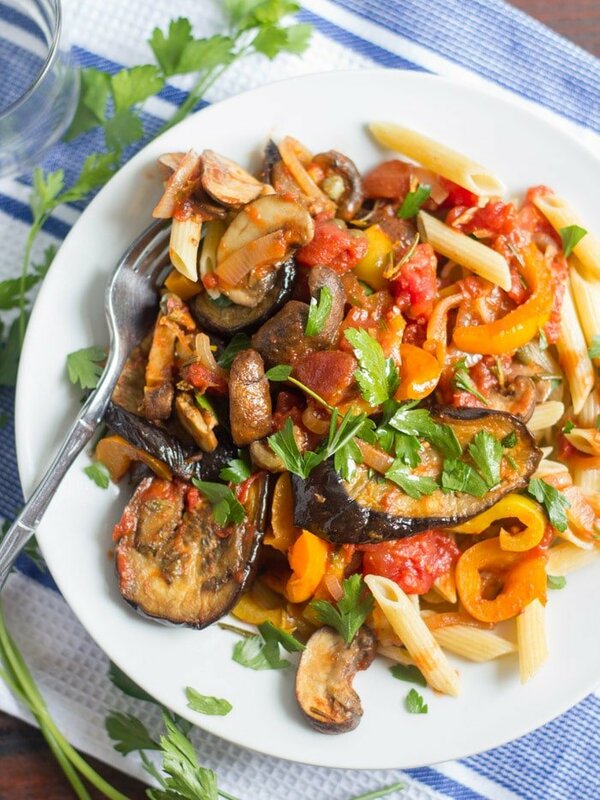 Mom would’ve loved eggplant cacciatore, had I come up with it at the time, and I’m pretty sure this would’ve done wonders to work up my enthusiasm for veggies back then. Well, here I am now with my veganized version of mom’s fave. Perfect timing actually, because not only am I perpetually psyched about veggies these days, but it’s also springtime, and a particularly chilly one when I live. This dish is perfect for (any day, but especially) spring days when there’s a little nip in the air. 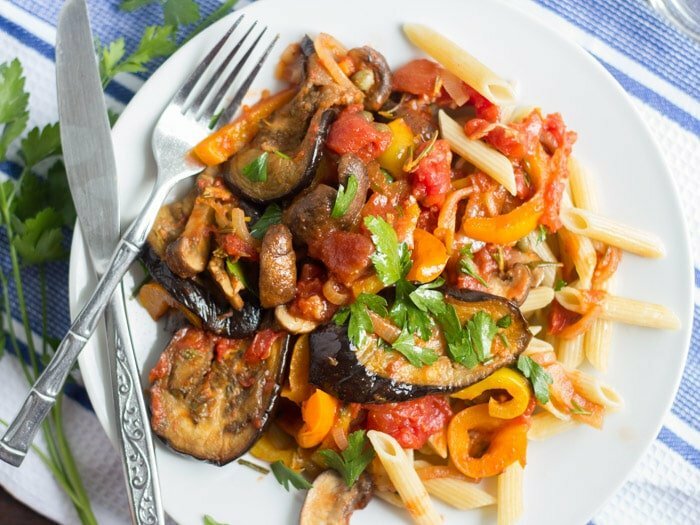 Though the dish features lots of summery veggies and a light sauce, but it’s also served over pasta (so it will fill you up!) and features savoy spices I crave on cooler days. Preheat oven to 400°. Line a baking sheet with parchment paper. Rub eggplant slabs with about 1 tablespoon of olive oil and arrange on baking sheet. Bake until eggplant slabs are lightly browned and tender, but not falling apart, about 20 minutes. Remove from oven and set aside. While eggplant bakes, bring a large pot of water to a boil. Add pasta and cook according to package directions. Drain into a colander, return to the pot and toss with a bit of olive oil. Set aside. 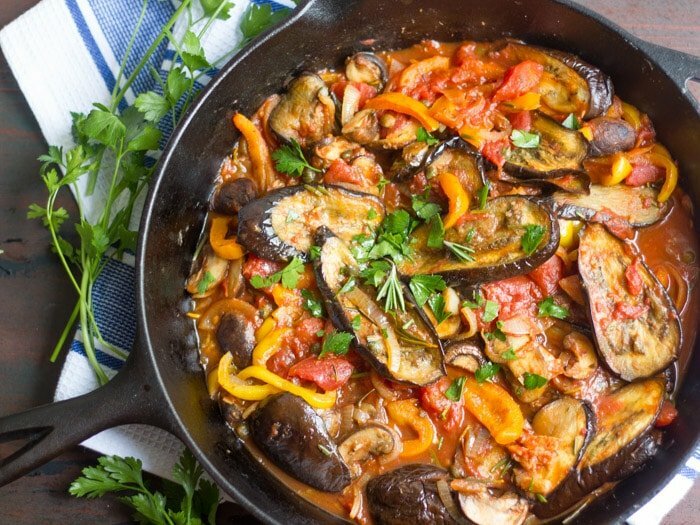 While eggplant bakes and pasta cooks, coat the bottom of a large skillet with 1 tablespoon of olive oil and place over medium heat. Add mushrooms to skillet in an even layer. Cook about 5 minutes on each side, until slightly browned and tender. Remove from skillet and transfer to a plate. Add remaining 1 tablespoon of olive oil to skillet. Add bell onion and bell pepper. Sauté about 5 minutes, until tender. Add garlic and sauté 1 minute more. Add wine and bring to a simmer. Allow to cook until liquid is reduced by about half, 3 to 4 minutes. Add diced tomatoes, crushed tomatoes, capers, rosemary, oregano and red pepper flakes to skillet. Return mushrooms to skillet. Give everything a stir and bring to a simmer. Allow to cook about 5 minutes. Gently stir roasted eggplant into mixture and bring back to a simmer. Allow to cook until all veggies are tender and sauce thickens up just a bit, about 5 minutes more. Remove from heat and season with salt and pepper to taste. Divide pasta among 3 or 4 plates and top with eggplant mixture, serve. If your eggplants have been hanging around for a while, salt them first. Sprinkle slices liberally with salt and allow to sit for 30 minutes. Rinse well, then dry. I used 3 small eggplants. If you're working with 1 or 2 larger eggplants, feel free to cut the slabs in half or even dice them so they're easier to work with. I’m 70 years old and chicken cacciatore was a biggie when I was growing up. I hated it because of the thick tomato sauce and greasy chicken; I simply didn’t like meat. Can’t wait to make eggplant cacciatore this summer when the eggplants and fresh tomatoes are plentiful at the farmers’ markets. Thank you! Thank you!! One thing I’ve discovered since I started blogging is that there are so many dishes that I was never into in their traditional form, but that I LOVE once veganized. :) This one should be perfect for those summer veggies. I hope you love it as much as I do! Alissa, this looks SOOOO good! I love eggplant and I used to LOVE eggplant cacciatore!!! What a brilliant dish! I’m so glad to hear that! Thank you Cara! This was absolutely delicious. I am new at plant based cooking and this will be a staple on my menu. The only change I would make is, although I love rosemary, is this dish I will be replacing it with Basel the next time I make it. My husband was very happy with it too. I’m so glad you enjoyed it! Thanks Karen!! Quinoa or farro would be nice! Is there anything I could sub for the wine? Maybe more water? I think more water or vegetable broth should work. Can u use cooking wine rather than white wine. I made this yesterday and it was simply delicious and gorgeous with all those colours! Thank you for sharing a great recipe. I’m so glad you enjoyed it!! Thanks Jenny! On the Daniel Fast and getting tired of vegan chili, vegetable soup and salads. I am making this tonight. Eggplant was on sale and thought buy it then go home and find recipes. Glad I found this one! Loved it, added moe liquid-wine and cushed tomatoe. Pep time was way moe than 15 minutes. Absolutely delicious…five star recipe. HOWEVER, the prep time was closer to an hour than 15 minutes. Maybe she has Ninja fingers…LOL. I’ll cook it again, but definitely on a weekend not a work night. This was delicious! Beautiful recipe, love the briny capers, herbs, spice from the red peppers, and the tender veggies. I added balsamic glaze for a bit of sweetness! Definitely will make this one again, thanks! Balsamic glaze sounds delicious!! I’m glad you enjoyed this! Thanks Crissy! This recipe for eggplant cacciatore was awesome. It is easy for meat-eaters to enjoy because it is packed with so much flavor. Delicious! I’m so glad you think so!! Thanks so much Mimi! Is this a good make ahead dish? One dat ahead? It is! If you’re serving it over pasta I’d store the stew and pasta separate. I love your creative ideas. I cooked several already and they were always delicious. I’m looking forward to this recipe. The big but now, as European, Austrian, it would so much help, if you could write the amount in European specifications like gramm/kilo. Thank you very much! Best regards from Vienna! Thanks Petra! I’m so glad you like the recipes! And thanks for asking about the units – I just looked into it and I should be able to add a conversion tool to my recipe cards pretty easily. I’ll try to get it done this week! Thank you very much! It would be much more easier for me. 😊 And thanks for being open minded!